Revel in irresistibly soft and perfumed skin.Want to feel irresistible every day?Revel in an irresistibly fragranced skin with LUX Soft Touch beauty bar. Formulated with new breakthrough Floral FusionTM Oil, this fragrant body soap has twice the perfume bloom of real flowers that takes every shower to the next level. Exquisite heart notes of French Rose and white florals come together in a perfect symphony, enveloping you in a warm, floral cocoon that lingers after the shower.Luxuriate in the fine fragrance as you wind down for the night. Or when you’re getting ready to go in the morning. The subtle scent of French Rose lingers on your skin, making it the perfect fragrance for any occasion. 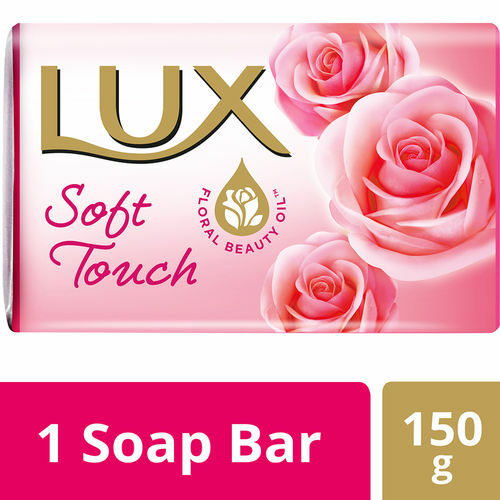 LUX Soft Touch beauty bar is the perfumed soap bar that brings out your extraordinary every day, with every shower.Lather away and make it a pampering session. The lush bubbles soap up to a decadent cleanses that feels as if you are drifting on a bed of roses. Caressed with the velvety French rose petals, your delicately perfumed skin feels moisturized and silky-soft.The LUX Perfumed Bath Collection of Body Washes and Beauty Bars blend rich lather and sophisticated fragrances, crafted by the world’s best perfumers that help women feel fabulous, every day. Explore the entire range of Soaps available on Nykaa. Shop more Lux products here.You can browse through the complete world of Lux Soaps .